Matt built and I helped erect the skeleton for our Hoop House today! I blogged about it over on our upcountryrecipes.com website if you would like to read more about it. We plan to grow in the hoop house in addition to our gardens. 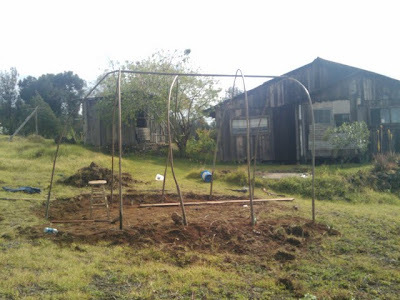 Flowers, and food will flourish in our new green house. These are the sorts of projects that make my recovery interesting! I am prepared for a great visit with Dr. Clarke tomorrow morning. I feel confident that I have opened the 3 more millimeters that I am shooting for. Wish me luck! Also on the agenda for tomorrow is the second run for menu items for the Open House next Friday. Get excited!